Full of flavours and delicately prepared North Indian and vegetable delicacies of Handi Restaurant are dearly loved by all Asian foodies in Dubai. This fresh and delicious food of Handi Restaurant has perfect flavours and aroma that can excite the taste buds of guests without overwhelming them. It is because of these fine features, the dining experience of Handi Restaurant’s guests becomes a supreme culinary voyage, which they will never forget. On top of it, friendly and warm welcoming behaviour of its staff members makes this trip even better. The interior of this venue is also quite fabulous, but it is not decorated in a stuffy and pretentious way, which makes it quite subtle. People of Dubai can find this restaurant on the ground floor of Taj Palace Hotel that is located at Al Makhtom Road in district Deira, Dubai, which is a central location and thinly populated. 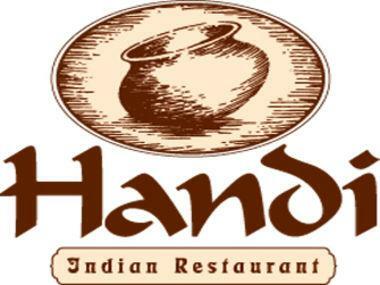 Handi Restaurant is well-liked for its delicious and succulent north Indian and vegetarian dishes. These dishes are prepared from the best available ingredients. Plus the chefs have mastered the art of maintaining the quality of the food. In addition to this, expert musicians play live music at this elegantly decorated restaurant, where outdoor seating is also available to relish the food in open air. Biryani and tandoori varieties are the signature dishes of this eating place, which guests can bask in during lunch or dinner hours throughout the week. Handi Restaurant serves lunch from 12:00 pm to 3:30 pm and dinner is dished up between 7:00 pm and 11:30 pm. This bistro opens on all days of the week and follows these operational hours throughout. Taj Palace Hotel, Al Rigga - Dubai - United Arab Emirates. Union Metro Station 1 is exactly 1.o kilomeytre away from the Handi Restaurant at Taj Palace Hotel. The walking from this Union Metro Station 1 to Handi Restaurant will take about 13 minutes. If a patron heads out in the southwest direction on Omar Bin Al Khattab Road/D 88 towards Al Maktoum Road/D 89, after exiting from this metro station and then turn left onto Al Maktoum Road/D 89, the destination will be found on the right side. Clock Tower Roundabout 1 bus station is 130 metres away from the Handi Restaurant and you can reach there by using 4, 11A, 27, 53, 64A, C1, C4 and C5 buses. By walk a bus user can cover this distance in about 2 minutes, if he or she heads in the west course on Al Maktoum Road/D 89, from where destination is not too far on the left side. 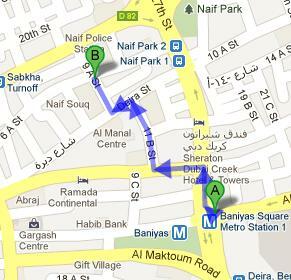 Follow the directions on map.